The emergence of Enterprise Architecture as a discipline of its own has put the light on the necessary distinction between actual (aka business) and software (aka system) realms. Yet, despite a profusion of definitions for layers, tiers, levels, views, and other modeling perspectives, what should be a constitutive premise of system engineering remains largely ignored, namely: business and systems concerns are worlds apart and bridging the gap is the main challenge of architects and analysts, whatever their preserve. The consequences of that neglect appear clearly when enterprise architects consider the alignment of systems architectures and capabilities on one hand, with enterprise organization and business processes on the other hand. Looking into the grey zone in between, some approaches will line up models according to their structure, assuming the same semantics on both sides of the divide; others will climb up the abstraction ladder until everything will look alike. Not surprisingly, with the core interrogation (i.e “what is to be aligned ?”) removed from the equation, models will be turned into dummies enabling alignment to be carried out by simple pattern matching. When models are understood as symbolic descriptions built from different perspectives, all layers targets the same context, each with a different concern. Along that understanding each view is associated to a specific aspect or level of abstraction: processes view, functional view, conceptual view, technical view, etc. As it happens, many alignment schemes use, implicitly or explicitly, the second understanding without clarifying the underlying assumptions regarding the backbone of artifacts. That neglect is unfortunate because, to be of any significance, views will have to be aligned with regard to those artifacts. From a practical point of view, alignment is meant to deal with two main problems: how business processes are supported by systems functionalities, and how those functionalities are to be implemented. Given that the latter can be fully dealt with at system level, the focus can be put on the alignment of business processes and functional architectures. A naive solution could be to assume services on both processes and systems sides. Yet, the apparent symmetry covers a tautology: while aiming for services oriented architectures on the systems side would be legitimate, if not necessarily realistic, taking for granted that business processes also tally with services would presume some prior alignment, in other words that the problem has already been solved. The pragmatic and logically correct approach is therefore to map business processes to system functionalities using whatever option is available, models (CIMs vs PIMs), or views (processes vs functions). And that is where the distinction between business and software semantics is critical: assuming the divide can be overlooked, some “shallow” alignment could be carried out directly providing the models can be translated into some generic language; but if the divide is acknowledged a “deep” alignment will have to be supported by a semantics bridge built across. Just like models are meant to describe sets of instances, meta-models are meant to describe instances of models independently of their respective semantics. Assuming a semantic continuity between business and systems models, meta-models like OMG’s KDM (Knowledge Discovery Meta-model) appear to provide a very practical solution to the alignment problem. Software (aka design) models are translated into functional architectures. Models of business processes are made compatible with the generic language used for system models. Associations are made based on patterns identified on each side. Factually inconsistent: it is denied by the plethora of candidates claiming for the role, often with partial, overlapping, ambiguous, or conflicting semantics. Logically inconsistent: it simply dodges the question (what’s the meaning of alignment between business processes and supporting systems) either by lumping together the semantics of the respective contexts and concerns, or by climbing up the ladder of abstraction until all semantic discrepancies are smoothed out. Alignments built on that basis are necessarily shallow as they deal with artifacts disregarding of their contents, like dummies in test plans. As a matter of fact the outcome will add nothing to traceability, which may be enough for trivial or standalone processes and applications, but is to be meaningless when applied at architecture level. Compared to the shallow one, deep alignment, instead of assuming a wide but shallow commonwealth, tries to identify the minimal set of architectural concepts needed to describe alignment’s stake. Moreover, and contrary to the meta-modelling approach, the objective is not to find some higher level of abstraction encompassing the whole of models, but more reasonably to isolate the core of architecture concepts and constructs with shared and unambiguous meanings to be used by both business and system analysts. 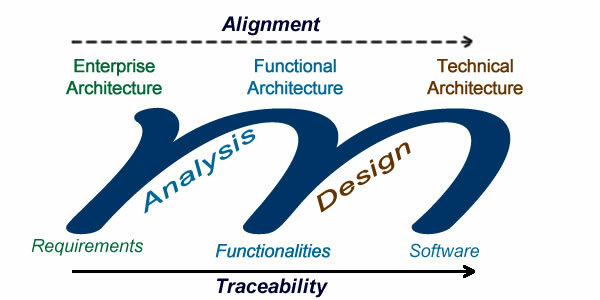 Deep alignment makes a distinction between what is at stake at architecture level (blue), from the specifics of process or domain (green), and design (brown). Platform specific models (PSMs) can be obtained through transformation from PIMs, generated using specific languages, or refactored from legacy code. Alignment can so focus on enterprise and systems architectural stakes leaving the specific concerns dealt with separately, making the best of existing languages. As mentioned above, comparing alignment with traceability may help to better understand its meaning and purpose. Traceability is meant to deal with links between development artifacts from requirements to software components. Its main objective is to manage changes in software architecture and support decision-making with regard to maintenance and evolution. Alignment is meant to deal with enterprise objectives and systems capabilities. Its main objective is to manage changes in enterprise architecture and support decision-making with regard to organization and systems architecture. As a concluding remark, reducing alignment to traceability may counteract its very purpose and make it pointless as a tool for enterprise governance.